The agreement allows Replacement Line 3 to be built along the existing corridor through the Reservation with a comprehensive set of safety, environmental, economic, and financial benefits to the Band. These are benefits that would not be possible if Line 3 was built outside the Reservation. Line 3 is one of several pipelines running through Enbridge’s Main Line corridor. The agreement extends Enbridge’s easement for all pipelines for an additional 10 years. 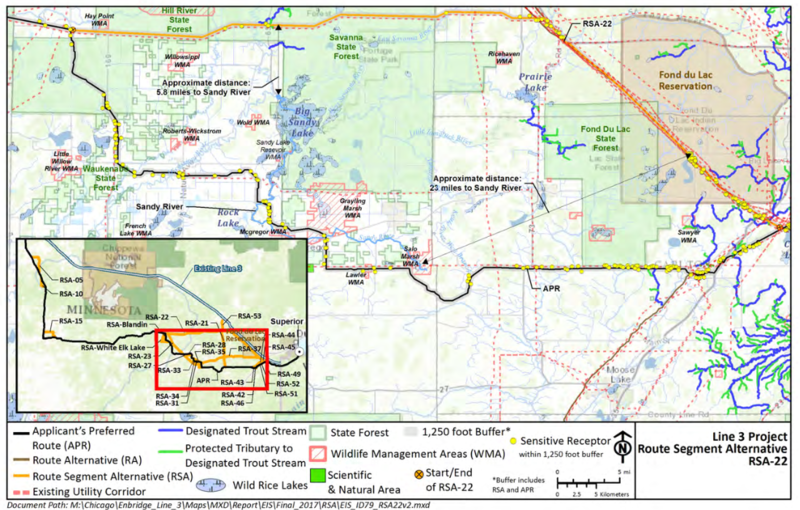 The easement was set to expire in 2029 and it will now expire in 2039. Comments: Fond du Lac’s big wins include the financial compensation Enbridge will pay for the easement. That figure is confidential, according to a letter the Band and Enbridge jointly sent to the Minnesota Public Utilities Commission (PUC). The Band’s decision also avoids creating a brand new pipeline corridor just south of the Reservation — and all of the negative environmental impacts that would create. Enbridge’s wins are the new easement and an agreement from Fond du Lac that it will not “participate in any opposition to the project.” This means that the Band can’t sue to stop the pipeline, arguing it violates the Band’s treaty rights to hunt, fish and gather along the pipeline’s route in the area covered by the 1854 Treaty. These rights to hunt, fish and gather outside the Reservation have been a big point on contention in the PUC hearings. Regarding Enbridge’s agreement to remove the old Line 3 from tribal lands, Ennbridge would have had to do that anyway. The PUC decision approving the pipeline said all landowners affected by the pipeline would be given the option to have it removed or receive a monetary settlement to leave it in place.